Have you heard of "Visual Scripting?" -- a method of drafting comics first developed by Alison Bechdel and then refined and written about my Jessica Abel? I hadn't either until just a few months ago when a colleague in comics, Jesse Lambert, mentioned it to me. 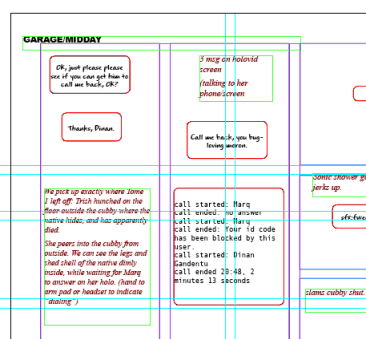 It has changed my process of drafting comics completely. You can read about Bechdel's process in Abel's book, Mastering Comics (one of two great books she co-authored about creating in this medium). Or you can check out her several posts online about it as well. Start here. This website is the source for the images below. Though Abel is telling us how to use InDesign (an Adobe page layout software) to do this), don't get hung up on the technology (it's expensive). You can use this method to great effect on regular paper, or with a free app on an ipad called Adobe Comp CC. 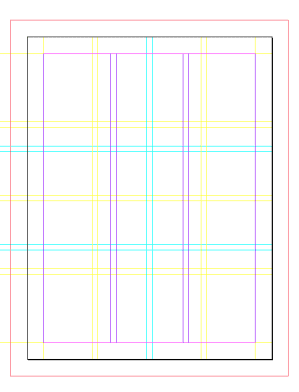 There's grids and color coding and nerdy stuff like that. It was a little overwhelming at first. But especially for me, a writer, who struggles to turn on my visual brain, this has been amazing and worth the effort! Then, you use words to script the words of the comics as well as to describe what you will draw, roughly planning out the visuals, but recording them quickly only with words, but in the actual space of the page. I find this much much much more inspirational to my writer's brain than writing a normal script and then trying to translate it to a visual page. This post also includes links to her template and a video. I'll share more soon on my process with this method.